Amazon Echo is a hands-free speaker you control with your voice. 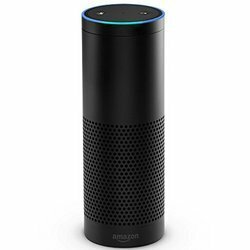 Echo connects to the Alexa Voice Service to play music, provide information, news, sports scores, weather, and moreinstantly. All you have to do is ask. Echo has seven microphones and beam forming technology so it can hear you from across the roomeven while music is playing. Echo is also an expertly tuned speaker that can fill any room with 360 immersive sound. When you want to use Echo, just say the wake word Alexa and Echo responds instantly. If you have more than one Echo or Echo Dot, you can set a different wake word for eachyou can pick Amazon, Alexa or Echo as the wake word. Echo has been fine-tuned to deliver crisp vocals with dynamic bass response. Its dual downward-firing speakers produce 360 omni-directional audio to fill any room with immersive sound. Tucked under the light ring is an array of seven microphones that use beam-forming technology and enhanced noise cancellation. With far-field voice recognition, Echo can hear you ask a question from any directioneven while playing music. When you want to use Echo, simply say the wake word, Alexa, and Echo lights up and streams audio to the cloud, where the Alexa Voice Service is leveraged to recognize and respond to your request instantly. Learn more about voice recognition on Echo. Alexathe brain behind Echois built in the cloud, so it is always getting smarter. The more you use Echo, the more it adapts to your speech patterns, vocabulary, and personal preferences. And because Echo is always connected, updates are delivered automatically. Just in the last few months weve added local search from Yelp, movie showtimes, Samsung SmartThings support, Google Calendar, Audible audiobooks, text-to-speech for Kindle eBooks, and over 100 new skills from third-party developers. Skills add even more capabilities like ordering a pizza from Domino's, requesting a ride from Uber, opening your garage with Garageio, and more. Enabling skills lets your Echo do even moresimply discover and enable the skills you want to use in the Alexa App. Use Echo to switch on the lamp before getting out of bed, turn on the fan or space heater while reading in your favorite chair, or dim the lights from the couch to watch a movieall without lifting a finger.